An online bachelor’s degree in social science covers all aspects of human society and social life, from small groups to large-scale institutions. In this age of globalization and diversity, the multidisciplinary field of social science provides clarity about issues of culture, class, race, and gender, with an emphasis on research and data analysis. Graduates with a social science bachelor’s degree pursue many interesting career paths, including teaching, social services, survey research, and market analysis. In addition, the Bureau of Labor Statistics (BLS) projects that employment in social science occupations will grow by 10% from 2016 to 2026. What Will I Learn in an Online Bachelor’s in Social Science Program? What Are the Best Online Bachelor’s in Social Science Programs? 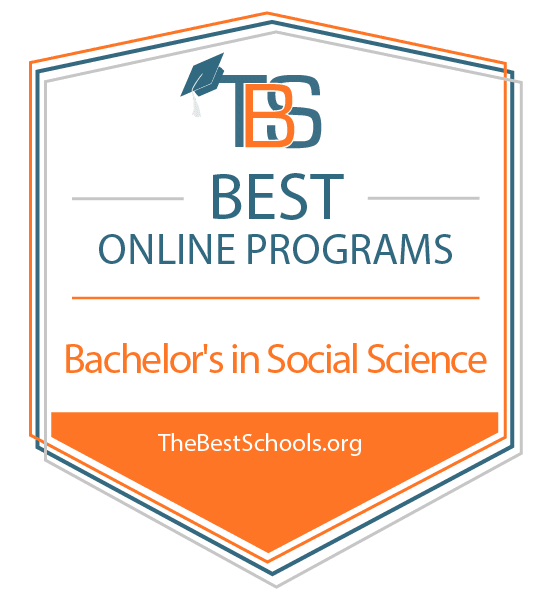 Online Bachelor’s in Social Science Degree Program Ranking Guidelines: We selected the degree programs based on the quality of program and range of courses provided, as well as school awards, rankings, and reputation. Situated 13 miles east of downtown Orlando, UCF’s main campus boasts a student body of more than 66,000 individuals — the largest single-campus enrollment in the United States. Offering more than 200 majors through 13 colleges, the university also maintains 10 regional campuses throughout the state, as well as a robust online education program. UCF’s web-based BS in social science takes a multidisciplinary approach to the field, providing a solid foundation of broadly-applicable theoretical knowledge, communication strategies, and research skills. After declaring a major from 13 available options, candidates must select three minors from different departments, which include anthropology, communications, political science, psychology, and sociology. Prior to graduation, students must complete one research methods course and one statistics course. Learners are also required to take an exit exam, although they do not need to receive a passing score. Program graduates are prepared to pursue entry-level positions in a variety of fields, or apply to a master’s program at UCF or beyond. Along with their application, prospective students should provide high school or home school transcripts, any relevant college transcripts, and SAT or ACT scores. Like their on-campus counterparts, online students are able to earn honors awards, join undergraduate research teams, and pursue internships in the social sciences. Distance learners also receive access to UCF’s library, academic resources, advisors, writing center, and career services office. Located in the heart of the Puget Sound metro area, UW’s main campus serves more than 46,000 students every year. Home to seven Nobel Prize winners and 15 MacArthur Fellows, UW is also widely recognized for maintaining one of the world’s largest university libraries. Learners may pursue one of 606 degree options available at three campus locations and online. Combining asynchronous and cohort learning formats, UW’s 185-credit bachelor of arts in integrated social sciences program lets distance learners complete assignments and review course materials at their convenience. Coursework is divided into seven core thematic areas that explore various aspects of the field, from technology and health practices to intercultural power relations. Classes address a variety of unique and engaging topics, including social science theory in context, black cultural studies, Filipino histories, and social justice in the city. Prior to graduation, learners complete a capstone experience, in which they create, publish, and present a comprehensive portfolio that demonstrates their acquired knowledge and skills. Part-time students typically earn their bachelor of social science in three to four years, while those enrolled full-time may complete the program in as little as one year. Prospective students must hold at least 75 transferable quarter credits from a regionally accredited college or university and a cumulative GPA of 2.0 or higher. UW operates on a quarter system, and new cohorts begin every spring and fall. UW is regionally accredited by the Northwest Commission on Colleges and Schools (NCCS). Dickinson State University was established in 1918 with the goal of training teachers in rural North Dakota. Today, DSU is a public four-year institution and a member of the North Dakota University System. DSU serves just over 2,700 students and offers majors in more than 75 fields, including an online bachelor of arts in composite social science [PDF]. The 120-credit social science bachelor’s degree curriculum introduces foundational critical thinking skills, social science theories, and quantitative and qualitative research methods. In addition to completing mandatory general, major, and elective coursework, students must declare a minor and fulfill a foreign language requirement. Over 60 hours of major-related coursework, learners explore the major principles of sociology, modern American culture and government, and microeconomics. Other classes address geography, world civilizations, and basic concepts in political science. The program culminates in a research-focused capstone seminar. Full-time students typically earn their degree in around four years. Prospective DSU students must provide documentation of having completed four units of English, three units of mathematics (Algebra one and above), three units of laboratory science, and three units of social studies at the high school level. Applicants under the age of 25 must also hold an ACT score of at least 18 or an SAT score of 940 or higher. Tuition rates vary considerably, depending on the student’s state of residence. DSU maintains a tuition reciprocity agreement with the state of Minnesota, and residents of states contiguous to North Dakota receive a significant tuition discount. DSU is regionally accredited by the Higher Learning Commission (HLC). Known for offering world-class academic programs, this private university counts 36 Nobel Laureates, 30 Academy Award winners, and 30 Pulitzer Prize winners among its alumni. NYU serves a combined student body of 50,000 at campus locations in New York City, Shanghai, and Abu Dhabi, while its School of Professional Studies offers accessible online and hybrid programs. Based on a solid liberal arts foundation, NYU’s bachelor of arts in social sciences develops analytical, critical thinking, and writing skills. Building upon prior knowledge, the core curriculum strengthens fundamental competencies in expository writing, critical thinking, and mathematical reasoning. Degree candidates also complete 20 credit hours of concentration coursework related to their chosen sub-field of social science. Students may select from 12 available concentrations, including anthropology, international studies, economics, and organizational behavior and change. While program length varies slightly according to concentration, most students complete 128 to 130 credit hours before earning a bachelor’s degree in social science. The majority of NYU’s online courses are presented in an asynchronous format, although some may require virtual meetings and discussion sessions. Program applicants must hold an associate degree or 60 transferable college credits. A minimum GPA of 3.3 is preferred, but not required. Along with an application, prospective students should submit a current resume, letters of recommendation, and a personal statement. Students may receive prior learning credit by submitting a portfolio, undergoing proficiency exams, or demonstrating sufficient knowledge of a foreign language. NYU is regionally accredited by the Middle States Commission on Higher Education (MSCHE). Troy is one of the Alabama’s fastest growing cities, and Troy University is expanding right along with it. As the state’s third-largest higher education institution, Troy educates more than 18,000 students at its four Alabama campuses and 60 teaching sites scattered across 17 states and 11 foreign countries. Along with an array of traditional and hybrid programs at multiple degree levels, the university offers numerous web-based degrees in a variety of disciplines. Distance learners have a diverse selection of undergraduate majors to choose from, and many pursue degrees in European history, criminal justice, business, or a bachelor’s degree in social science. Consisting of 120 credits, the social science bachelor’s degree program incorporates concepts from multiple disciplines, including anthropology, economics, and geography. Major coursework emphasizes critical thinking, the statistical and spatial applications of social science inquiry, and scholarly research methodologies. Learners also complete 21 credit hours within one of three concentrations. In addition to a general social science concentration, students may pursue a geography track, or a leadership concentration intended for prospective educators. Full-time learners typically complete the program in around four years, and many graduates go on to pursue entry-level roles in public affairs, social work, and criminal justice. Freshman applicants must hold a high school diploma or a GED, and prospective students under the age of 25 should also provide official ACT or SAT scores. Troy accepts an unlimited number of transfer credits earned at accredited institutions. Troy University is regionally accredited by the Southern Association of Colleges and Schools Commission on Colleges (SACS). WSU’s reputation as a top-tier research university stretches back to 1890, when this land-grant school was established to provide residents of southeastern Washington with agricultural and industrial training. Today, WSU is the second-largest higher education institution in the state, with four research facilities, one campus extension location in every county, and a thriving eLearning division. One of WSU’s most flexible web-based programs, the bachelor in social science online degree curriculum presents numerous specialization opportunities. Candidates may select up to three concentrations in areas such as anthropology, comparative ethnic studies, criminal justice, and economics. Students have the option of choosing two concentrations and completing 24 credits in the primary area and 15 in the secondary, or three nine-credit concentrations and 12 elective credits in the social sciences. Learners must also fulfill a foreign language requirement, and complete 12 credits in the humanities and eight hours of lab-based natural science coursework. Distance learners enjoy numerous resources, including personalized academic assistance through the Virtual Mentor program and round-the-clock access to streaming media archives. Lab materials are automatically mailed to students at the start of each semester, ensuring that online learners are fully prepared to participate in classes. While the program normally takes four years to complete, individuals who have earned an associate degree at select institutions may finish their degree in two years or less. Distance Tuition rates are based on state of residence and overall course load. WSU is regionally accredited by the Northwest Commission on Colleges and Universities (NWCCU). Brandman University is a private, non-profit institution that specializes in creating flexible, affordable academic programs for working adults. Operating according to a competency-based education model, Brandman encourages learners to draw on their life experiences and professional backgrounds for course credit and academic inspiration. The California-based university’s robust distance learning division offers 31 web-based undergraduate programs, many of which feature accelerated curriculums and self-paced coursework. Using cutting-edge technology, students pursuing a BA in integrated social sciences acquire crucial data analysis skills as they explore the connections between people, culture, and geography. Major requirements for the 45-credit curriculum emphasize research design, quantitative methods, and statistical models used across multiple disciplines. Building upon this base knowledge, elective courses provide opportunities for the in-depth study of two or more specialized fields. Learners may personalize their experience by selecting courses in social work, marketing, legal studies, and seven other areas before synthesizing their acquired knowledge in a final capstone course. Prospective social science bachelor’s degree candidates must hold 12 or more undergraduate course credits with a minimum cumulative GPA of 2.0 from a regionally accredited school. Those without sufficient college experience may earn the required credits through the Brandman Track program, which offers traditional online and self-paced options. The four-course curriculum takes eight or four weeks to complete, depending on format. Per-credit unit tuition rates are identical for in- and out-of-state students. Brandman is regionally accredited from the Western Association of Schools and Colleges Senior College and University Commission (WSCUC). This Albany, New York institution got its start in 1971 as an external degree program and continues to offer most of its programs through distance education. A large percentage of Excelsior’s 36,000 students are employed full-time, and more than half are over the age of 30. The university offers over 30 degrees in five fields of study, including a web-based bachelor of science in social sciences. Degree candidates complete 60 credits of arts and sciences coursework and 60 in applied professional courses, along with at least 33 elective credits. Core requirements include one course related to social or economic organization, two research-based classes, and a 3-credit capstone course. Elective options cover a variety of engaging topics, from social contemporary social problems and globalization to lifespan developmental psychology. Students must maintain a cumulative 2.0 GPA throughout the program to graduate, and most full-time distance learners earn their degree in just under three years. Transfer students pursuing a bachelor of social science online degree at Excelsior may count up to 117 credits toward program requirements. The university also grants credit for completing college-level exams such as AP or CLEP, professional education, work experience, and military training. Excelsior offers interest-free monthly tuition payment plans, and active-duty military personnel and their families receive significant tuition discounts. Students employed at partner organizations are also eligible for reduced rates. Excelsior is regionally accredited by the Commission on Higher Education of the Middle States Association of Colleges and Schools. Located between Kansas City and Salina, KSU is the state’s oldest public university. Established in 1858 as a land- and space-grant agricultural institute, KSU now educates almost 23,000 students in 65 academic departments. The university’s Global Campus initiative features over 70 online degrees and professional programs, including a bachelor of science in interdisciplinary social science. This 120-credit curriculum encompasses nine related content areas, including economics, history, anthropology, geography, and mass communications. Learners examine societal institutions and culture through the lens of each discipline, acquiring a solid foundation of broadly-applicable theoretical knowledge. General education coursework underscores themes introduced by major courses, presenting research methodologies and developing competencies in academic writing, quantitative reasoning, and statistical analysis. After receiving full admission to the university, students may enroll in up to 21 credits per semester. A cumulative GPA of 2.0 or higher is required to graduate. Courses are presented in several different formats, and often include teleconferences, live streaming lectures, and virtual group discussions. A few classes may require students to arrange proctored exams at local facilities. KSU accepts applications during the spring, summer, and fall semesters. Applicants with more than 24 transfer credits must hold a GPA of 2.0 or higher, while prospective students transferring fewer than 24 college credits are required to meet KSU’s admissions standards for incoming freshmen. All students pay the same tuition costs per credit regardless of Kansas residency status. KSU is regionally accredited by the Higher Learning Commission (HLC) of the North Central Association of Colleges and Schools. CSU – Global was founded in 2007 to educate adult learners throughout Colorado and beyond. Committed to providing quality academic programs in flexible formats, CSU-Global strives to make higher education affordable as well as accessible. The university has not raised the cost of tuition in over six years, and prior to enrollment, every student’s tuition rates are frozen for the duration of their education. Today, more than 19,000 distance learners pursue one of CSU – Global’s 14 bachelor’s degrees and 12 master’s degrees every year. Intended for applicants with at least 12 transferable credit hours from another accredited institution, CSU – Global’s bachelor in applied social sciences completion program offers a rigorous introduction to the field. Over the course of 120 credit hours, learners explore a variety of pertinent topics, such as applied organizational psychology, community development, and ethnic relations. Students are also encouraged to select an area of specialization from 22 options that include criminal forensics, marketing, and public and non-profit management. Before earning a bachelor’s degree in social science, candidates complete both a research-based capstone course and a practicum experience at a nearby setting. Prospective CSU – Global students with fewer than 12 college-level credits, or whose GPA falls below a 2.3 should contact the university about alternative admissions options. Tuition rates are identical for in- and out-of-state learners, and numerous institutional scholarships are available to students who demonstrate significant financial need or academic excellence. CSU-Global is regionally accredited from the Higher Learning Commission (HLC) of the North Central Association of Colleges and Schools. Located in the waterfront community of Bristol, Rhode Island, Roger Williams University’s main campus is home to the state’s only law school and a host of traditional and web-based undergraduate programs. With 45 majors and minors to choose from and an average class size of 19, it’s no surprise that more than 6,500 individuals enroll at RWU every year. The university’s online degree offerings include a 120-credit bachelor of general studies in social science that covers topics from politics and culture to history. Students develop integral skills in critical thinking, analysis, communication, and problem solving as they examine current and historical events through the lens of social science. Core requirements present cross-disciplinary research methods, quantitative analysis, and data collection procedures used in fields such as sociology, anthropology, and political science. Learners also complete 66 credit hours of elective coursework from two or three concentration areas of their choosing. All courses are presented through Bridges, RWU’s unique eLearning platform. RWU’s School of Continuing Studies features open admissions, and applicants need only submit official transcripts or GED scores, and, when applicable, documentation of military service or CLEP exam results. The university’s generous transfer policy awards up to 90 college credit for eligible personal experiences, professional certification, military service, and employee training. RWU maintains partnerships with numerous companies, organizations, and schools, and offers significant tuition discounts to partner members and employees. RWU is regionally accredited by the Commission on Institutions of Higher Education of New England Association of Schools and Colleges, Inc. Located about 100 miles east of Seattle in the town of Ellensburg, CWU is Washington state’s fastest growing public university. Since founding the Finish Line virtual campus in 2011, CWU has quickly become a leader in online learning and the state’s largest provider of web-based educational programs. While approximately 2,500 of the university’s 12,000 students live on campus, the majority pursue degrees through distance education. CWU offers more than 135 majors, including an online bachelor of science in interdisciplinary studies-social sciences. This bachelor of social science program features a unique, customizable curriculum design, making it ideal for students who want to have a hands-on role in forming their course of study. Learners may pursue a large major of 62 credits, or combine a small 47-credit major with a traditional minor. Along with core courses that enhance communication, problem solving, analytical, and leadership skills, students complete elective coursework in at least three specialized academic areas. Specialization options include American Indian studies, geography, environmental studies, and women’s and gender studies. All students are required to develop a senior portfolio project, and must complete one social science research course in ethnographic field methods, research methods in criminal justice, or social science methods. Prospective social science degree candidates should hold at least 60 college credits and a minimum GPA of 2.25. CWU participates in the Western Undergraduate Exchange Program, which provides reduced tuition for residents of participating states. A public, nonprofit university located in Prince George’s County, Maryland, UMUC is one of the world’s oldest and largest providers of nontraditional higher education programs. Known for academic excellence, affordability, and innovation, UMUC’s virtual campus has received acclaim for replacing required textbooks with no-cost online course materials. More than 90,000 students enroll in one of the university’s 90 on-campus, hybrid, or web-based academic programs every year. UMUC’s 120-credit bachelor of science in social science combines theory with hands-on research, equipping students with the analytical problem-solving skills needed to communicate complex ideas. Along with one social science research course, learners complete a series of introductory classes across several social science disciplines. They may then choose to focus their major studies in anthropology, gerontology, psychology, or sociology. Unique and engaging course options include world prehistory and archaeology, health and aging, psychology of gender, and forensic investigation. A final capstone course prepares learners for entry-level social science occupations by exploring field-related professional and ethical issues. Program applicants who have not previously earned at least 24 college credits should hold a high school diploma or GED. Individuals with a GPA under 2.0 may receive provisional admission and complete seven credits with a 2.0 GPA before enrolling as regular students. Transfer students may count up to 90 credits towards their degree at UMUC, and college credit is also awarded through prior learning assessments and professional training and certification. Located in Worcester, Massachusetts, Assumption is a private, liberal arts college founded in the Catholic intellectual tradition. Established in 1904, the college now offers more than 40 majors in the liberal arts, sciences, business, and education to over 2,000 around the world. In keeping with its commitment to accessible and economical higher education, Assumption offers a variety of degrees online, including a bachelor of science in social sciences. Distance learners pursuing a bachelor of social science online degree complete 120 credit hours, or 40 courses. The unique curriculum is built upon a liberal arts core that includes religious studies along with English, philosophy, math, and science. Students also choose eight courses within a social science discipline such as economics, psychology, sociology, or criminal justice. The program concludes with a capstone project, during which students create a journal, film, portfolio, or other product equivalent in content to a three-credit, upper-level university course. Applicants must hold a high school diploma from an accredited school or a GED, or have passed five college-level courses. Prospective students with GPA of 2.5 may receive acceptance without conditions, while those with a lower GPA are permitted to enroll after fulfilling other qualifications. Online students receive access to Assumption’s tutoring and academic support services, and may also take on-campus courses if they choose to do so. At least 45 credits or 15 courses must be earned through Assumption. Assumption is regionally accredited by the New England Association of Schools and Colleges (NEASC) Commission on Institutions of Higher Education. Part of the Nevada System of Higher Education, Great Basin College is located in the northeastern city of Elko. The college maintains four branch campuses, more than 12 satellite facilities, and an eLearning division renowned for its use of cutting-edge interactive video technology. The majority of GBC’s 3,800 students are over the age of 25, and three-quarters of the student body is enrolled part-time. GBC offers professional certificates, associate degrees, and bachelor’s degrees with majors in fields such as business, education, health, and social science. Presented entirely online, the 120-credit bachelor of arts in social science is a completion program that emphasizes four core social science disciplines: history, psychology, anthropology, and political science. To receive admission, prospective students must hold an associate degree, or at least 60 credits from an accredited college or university. Because learners are expected to have previously completed all lower-division requirements, the bulk of the curriculum consists of upper-division courses such as Indians of North America, public opinion and political behavior, and social psychology. The program culminates in a mandatory capstone course, and students may pursue an optional internship experience. Because GBC is an open-admission institution, students may need to complete placement tests prior to enrollment. Out-of-state distance learners pay a slightly higher tuition rates than Nevada residents, although per-credit tuition varies according to course level. GBC offers several payment plans, including an option for veterans, and holds tuition reimbursement agreements with numerous organizations and companies. GBC is regionally accredited by the Northwest Commission on Colleges and Universities (NWCCU). The second-oldest campus in the California State University system, Chico State is a public institution located 90 miles north of Sacramento. Established as a teaching college, the university remains true to its roots while offering 125 bachelor’s degrees and over 30 graduate programs. While Chico State grants multiple teaching credentials to education majors, students pursuing degrees in other fields may tailor their curriculum to meet content-area teaching requirements. Graduates of the bachelor of arts in social science degree completion program are eligible to sit for the CSET exam, which is needed to pursue a secondary social studies education license. Major coursework examines the roles of individuals and groups within a culture, as well as how they relate to one another, through multidisciplinary perspectives. All students select a specialization, which requires 21 credits in a primary field of concentration and 15 credits in a secondary area. Primary specialization options include sociology and career and life planning. The latter track prepares learners to take on roles in educational advisement and career counseling. Distance learners also complete a mandatory computer course, along with a capstone project. Program applicants are required to hold an associate degree, or at least 60 college credits. Although students may earn up to 42 credits online, any remaining course requirements must be fulfilled at nearby community colleges. Guidelines differ slightly for those who intend to pursue teaching certification. CSU – Chico is regionally accredited by the Senior College Commission of the Western Association of Schools and Colleges (WASC). While its administrative offices are based in Saratoga Springs, SUNY Empire has 35 learning centers spread throughout the state of New York and additional locations in Lebanon, the Czech Republic, and Greece. As a longtime adult and distance education provider, SUNY Empire offers customizable online undergraduate degrees in addition to traditional on-campus programs. Distance learners have their choice of more than 400 web-based classes in 12 subject areas, including a bachelor of arts in social science. Social science online degree work alongside an academic advisor to develop a program of study that aligns with their individual career and academic goals. Presenting a broad survey of political, economic, and social structures, the core curriculum introduces a variety of theoretical and historical perspectives. Emphasizing critical thinking and comparative analytical methodologies, learners examine the limitations and strengths of major theories in the field before selecting a concentration. While popular concentrations include African American studies, social theory, political science, and women’s studies, many students choose to create a unique interdisciplinary academic track with the help of their advisor. Each course requires about 10 hours of study per week. Prospective students should hold a high school diploma, GED, or TASC, and must provide a personal essay along with their application and official transcripts. SUNY Empire accepts applications three times a year, and offers numerous institutional scholarships based on financial need. SUNY Empire is regionally accredited by the Middle States Commission on Higher Education (MSCHE). Known to locals and students alike as SEMO, this Cape Girardeau university maintains three regional campuses and two additional delivery sites in addition to a virtual campus. Thanks to SEMO’s unique emphasis on professional preparation and experiential learning, all 145 undergraduate programs include an internship or field study component. The university also offers a variety of career-focused distance education programs for undergraduates interested in research, law enforcement, public policy, or social service management. Requiring 120 credit hours, SEMO’s bachelor of arts in social science is highly customizable as well as flexible. Students master the theories and methodologies needed to excel in multiple disciplines through core courses that address research methods, problems in social science, and statistical analysis. In addition to their major, learners choose a minor concentration such as criminal justice, economics, psychology, history, or sociology. Much of the curriculum is adaptable, and newly enrolled distance learners work with an advisor to develop a personalized course plan. All classes are asynchronous, and presented in convenient 16- and eight-week terms. Internships may be arranged, but are not required. Prospective social science bachelor’s degree candidates must provide high school transcripts or the equivalent, and applicants who have earned fewer than 24 college credits are required to supply ACT or SAT scores. Missouri residents and out-of-state students pay the same tuition. Like their on-campus counterparts, distance learners receive access to SEMO’s career advising resources. SEMO is regionally accredited by the Higher Learning Commission’s Commission on Institutions of Higher Education. Situated less than two miles east of the Las Vegas Strip, UNLV’s student body of more than 30,000 is one of the most diverse in the country. The university’s degree offerings are equally varied, with over 350 majors available to students on campus. UNLV also offers 12 web-based degrees, including a bachelor of arts in social science studies. Working in conjunction with an academic advisor, students plan a curriculum that both satisfies the individual’s focus and presents a broad review of the field. By studying the history of the discipline, exploring competing theories, and analyzing social problems, learners gain a knowledge base that spans disciplines. The 120-credit program culminates in a capstone project, which may take the form of a presentation, project, or paper. Most full-time students are able to earn their bachelor of social science in around four years. To receive admission, freshman applicants must hold either GPA of 3.0 in 13 core high school credits, an SAT score of 1040, an ACT composite score of 22, or a Nevada Advanced High School Diploma. Those who wish to transfer should have at least 24 college credits and a 2.5 GPA or higher. Non-resident distance learners enrolled exclusively in web-based courses may qualify for discounted tuition, and freshmen are eligible to apply for scholarships awarded on a variety of criteria. The university offers additional funding opportunities for nonresident transfer students. UNLV is regionally accredited from the Northwest Commission on Colleges and Universities. A bachelor of social science online degree exposes students to social science disciplines, research applications, and tools for analysis most commonly used in these perspectives. Coursework in economics, sociology, anthropology, history, political science, research methods, and statistics make up some of the coursework within these programs, typically requiring four years of full-time study to complete. The social science curriculum emphasizes the acquisition of skills like verbal and written communication, critical thinking, decision making, and problem solving. Some programs may require students to complete an internship, an independent research project, or some other practical experience prior to graduation. A bachelor’s degree in social science creates a stepping stone to a variety of career opportunities. While many social science majors decide to pursue graduate education or a professional degree, others choose to enter the job market directly after earning their bachelor’s degree, finding entry-level positions in many occupational fields related to their major. A bachelor of social science degree provides a strong foundation for master’s and doctoral programs in social science-related fields, such as anthropology, psychology, sociology, or political science. A social science online degree can benefit students planning to continue in professional programs like law, social work, and health sciences. Each school offering a bachelor of social science online degree establishes its own distinctive requirements and curriculum. However, all programs provide students with a comprehensive overview of the major, including core social sciences courses and specialized fields of study. Many programs also allow students to select areas of interest within one or more of the social science perspectives. Introduction to Economics: Understanding the principles of economics is an important component of the social science major with direct relevance to many careers. This course explains major concepts, including microeconomics and macroeconomics, property rights, markets, and the role of government. Lectures and assignments cover the private and public sectors, money and banking, trade, taxation, employment, labor unions, wealth, and income distribution. Research Methods in the Social Sciences: This course introduces students to the common research methods in the social sciences, principles of social science research, and ethical responsibilities of researchers. A major section of the course includes an independent research project that requires students to define a research problem, write a proposal, collect empirical data, and analyze and report findings. Race and Ethnic Relations: The intersection of race and ethnicity with other structures of identity formation, such as gender, class, and nationality, occupies a central place in the study of social science with relevance to many professional and organizational environments. This course examines race and ethnicity as social constructions, stereotypes, prejudice and institutional discrimination, color-blind racism, immigration, and global racial and ethnic conflict. With its focus on all aspects of human behavior, a bachelor’s degree in social science leads to many career opportunities. The social science degree provides a foundation for employment in teaching or social work, and it delivers a solid preparation for graduate school. Graduates with research and data analysis skills may find employment in marketing research and related fields. Market Research Analyst: Market research analysts gather and interpret data on consumer behavior and market conditions. They also review and forecast potential demand for a company’s products or services, using statistical software packages. This career requires at least a bachelor’s degree with training in social science, research methods, and statistics. Some positions require a master’s degree in marketing, statistics, or a related field. High School Teacher: These teachers instruct students from grades 9–12, preparing them to enter the workforce or attend college. Most states require that high school teachers possess a bachelor’s degree with a major in a teachable subject area, such as the social sciences along with education courses. Public school teachers must also possess a state-issued certification. Social Worker: Social workers may be employed as family specialists, school advisers, health care advocates and substance abuse counselors. Entry-level positions are available for graduates with a bachelor’s degree in social work or the social sciences. Clinical social workers must complete an MSW degree and obtain a license in the state where they practice. When deciding on a school for your bachelor of social science online degree, be sure to investigate the institution’s accreditation. The process of accreditation verifies that schools have been evaluated by independent, external agencies to ensure that these colleges and universities deliver quality programs and continue to meet appropriate performance standards. Two types of accreditation are available to institutions of higher education: regional and national. The majority of schools — nearly 85% - — seek regional accreditation, more widely respected and generally considered more prestigious than national accreditation. Both the U.S. Department of Education and the Council of Higher Education Accreditation provide useful information and links to help you determine if a school, department, or program has received accreditation. The most successful students take the time to learn about career opportunities and what it takes to stand out in the competitive job market. Professional organizations allow students to network with others in the field and acquire the skills needed to enter a career or pursue graduate work. These associations in social science often offer membership discounts for undergraduate students and provide access to educational workshops, employment services, and resume help. National Social Science Association: In existence for over three decades, this association has become the largest interdisciplinary organization in the country. Membership is open to all social scientists, with a discounted annual rate available for students. The association hosts workshops and professional development conferences. Association for Public Policy Analysis and Management: APPAM hosts a network of educators and researchers in public policy fields. Social science students considering a career in public policy may apply for a student membership that includes a mentor program, job placement, and conference attendance. American Association of Behavioral and Social Sciences: AABSS provides networking opportunities for faculty, scholars, and students through a forum to share social science research. The association hosts an annual conference that showcases behavioral and social science scholarships.